Former Van Halen rocker and Cabo Wabo Tequila founder Sammy Hagar, and CityCenter Las Vegas celebrity chefs Shawn McClain, Todd English and Jean Phillippe-Maury created the evening’s spectacular dinner. Following the gala, Van Cleef & Arpels hosted an after party with Eva at her Beso Steakhouse and Eve nightclub in Crystals at CityCenter. Guests enjoyed Beso’s signature sangria and Cabo Wabo Tequila with the Desperate Housewives star, toasting to a night of fundraising success for Nevada Cancer Institute. The evening was full of touching moments and lots of laughs as Eva and Larry bantered on stage. In a stunning backless silver-and-purple sequined mini dress, Eva joked with the crowd that she was a little concerned about a wardrobe malfunction to which Larry suggested she just lose the dress to raise more money for NVCI. Noting that cancer is a cause near and dear to her heart, Eva contributed to the evening’s fund raising with a deal brokered over dinner to wish a very special “Happy Birthday” to Las Vegan Lorenzo Sartini in exchange for a $25,000 donation to NVCI. She offered, “How about this? For another $25,000 I’ll give you a birthday kiss.” Larry King joked, “Really? $50,000 is all it takes to get Eva Longoria?” to which she replied, “That’s just a kiss. I’m much more expensive. A million!.” Larry quipped, “Well at least we have a price.” Eva finished her speech on-stage, headed down to the audience to give Lorenzo his birthday kiss and enjoyed the rest of the program. Wearing his signature leather jacket with wife Shawn Southwick King in the audience, Larry King spoke about his commitment to Nevada Cancer Institute over the past nine years, and discussed his opportunity to tour NVCI earlier that day. “Nine years ago, when I first emceed Rock for the Cure, Nevada Cancer Institute was just a dream. Earlier today, I toured the Institute for the first time and saw the remarkable work they do first-hand. What an incredible accomplishment. Seeing these oncology experts giving cancer patients a second chance at life made me proud to support such a tremendous organization.” Finishing on a lighter note, joking about his much younger wife who he pointed out in the audience, Larry said, “I know what you’re thinking. When people look at Shawn and me, the first thing they notice is the age difference. But I’m here to say, if she dies, she dies.” The crowd roared. 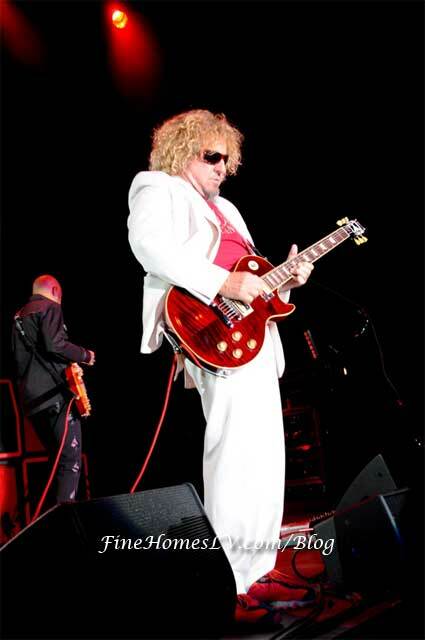 Rocker Sammy Hagar arrived in a gleaming white suit and red t-shirt, bright red sunglasses and matching sneakers. The Rock & Roll Hall of Famer, with beautiful wife Kari by his side, talked about his charitable endeavors. “When I created the Beach Bar and Grill at McCarran Airport, I decided that 100% of the profit would go to charity. So when Nevada Cancer Institute asked me to get involved with Rock for the Cure, I said, I’ll not only play for you but give you some money, too! It makes you feel good. My pockets are full!” In addition to taking the stage for an intimate concert of his popular hits from his solo album, “There’s Only One Way to Rock,” he also participated in the live auction. Sammy, the founder of Cabo Wabo Tequila and Cantina, donated an all-expense paid trip to Los Cabos, Mexico, a beachfront stay at the exquisite One&Only Resort in Palmilla, a signed bottle of the rare tequila Cabo Uno and two signed bottles of Cabo Wabo Reposado, which sold for $18,000. But Hagar didn’t stop there; The Hagar Family Foundation later presented a giant check to NVCI for $75,000. Four VIP Tickets to FOX’s American Idol season ten finale, admittance to the VIP after-party and a night at the SLS Hotel in Beverly Hills went for $11,000. An exclusive tour for four guests of NASA’s Johnson’s Space Center and one OMEGA Speedmaster 50th Anniversary Limited Edition timepiece sold for $24,000. Cirque du Soleil gave bidders the opportunity to “become a Cirque performer for a day” generating a $16,000 donation to NVCI. But the fundraising didn’t stop there; Cirque du Soleil pledged an astounding $1 million to the Institute. The big ticket item of the evening was an intimate dinner prepared by Celebrity Chefs Shawn McClain and Todd English for a group of 20 guests and served in the bidder’s home. The item was so popular, the chefs doubled their commitment, offering two dinners instead of one, ultimately raking in a total of $70,000 for Nevada Cancer Institute.